The Head of the Global Secretariat, Monica Bhatia and Ervice Tchouata, Tax Policy Analyst visited N’Djamena, Chad on 23-25 November 2016 to meet with senior officials and launch Chad's Induction Programme* and to welcome it into the Global Forum. They met with M. MBOGO Ngabo Seli, Minister of Finance and Budget, the Director General of Taxes, the Advisor to the Prime Minister, as well as the Advisor to the National Assembly who all confirmed Chad’s political and technical commitment to join the fight against tax evasion and implement the international standards of transparency and exchange of information for tax purposes. 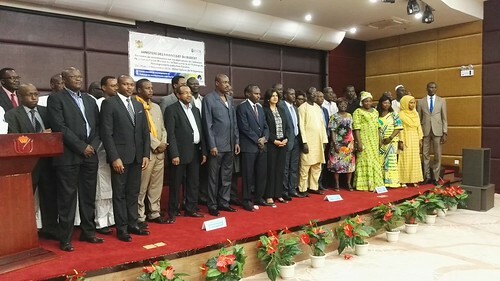 The meetings were followed by a two day seminar which covered the work of the Global Forum, steps to be taken to implement the standards and how Chad could benefit from participating in the global move towards greater tax transparency. The seminar was attended by over 60 officials from the Ministry of Finance, Tax Administration the Central Bank and the Anti money laundering authorities. The launch visit will be followed by preparation of a Roadmap containing steps to be taken over the coming three years by Chad and the Global Forum for Chad to implement and benefit from the international standards. * The aim of the induction programme is to help new members put in place the legal framework and practical infrastructure needed to benefit from exchange of information and enhance domestic revenue mobilisation, as well as preparing for their peer review.